Nov. 16, 2018, 9:33 a.m.
By Laura Hazard Owen @laurahazardowen Nov. 16, 2018, 9:33 a.m.
We find our respondents inundated with messages on WhatsApp and Facebook. There is a near constant flurry of notifications and forwards throughout the day on their phones — encompassing from news organizations updates to a mindboggling variety of social messages (for example, “inspiring quotes” and “good morning” forwards, the latter of which seems to be a peculiarly Indian phenomenon, even the subject of discussion in the international media). News providers — and there are tens of thousands of them in India — do not make it any easier, by sending regular, even incessant, notifications to phones. 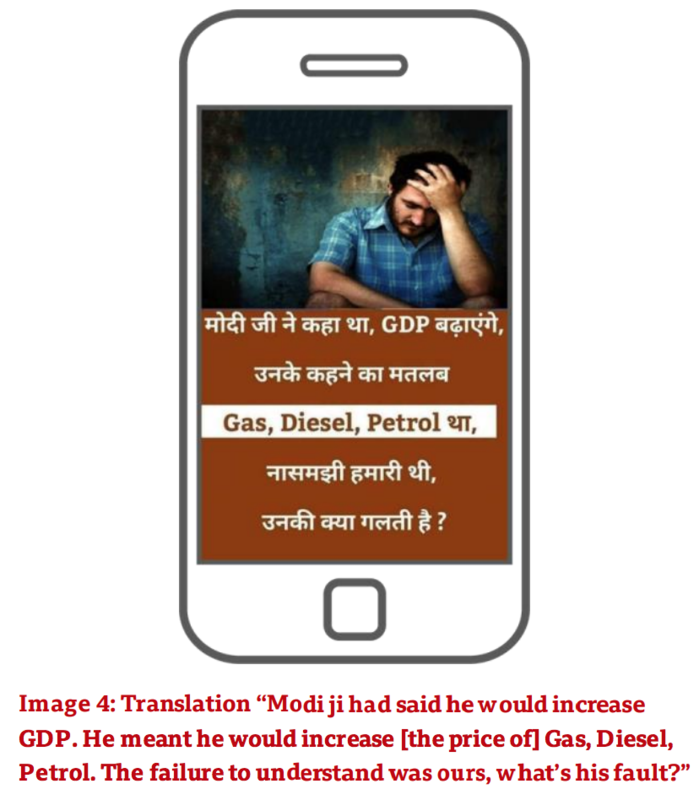 The canonical example of fake news, for example, the story about the Pope endorsing Donald Trump, created by Macedonian teenagers, and circulating all over social media, does not seem to be that prevalent in WhatsApp feeds in India. To be clearer, stories as a collection of words on a website, circulated in the form of the url, do not seem to be the most prevalent means of sharing information (and disinformation). The form of information that is consumed or engaged with more, is visual information, sometimes layered with a minimum amount of text. This suggests that the chances of a fake news message spreading on a nationwide scale on WhatsApp might actually be quite limited. 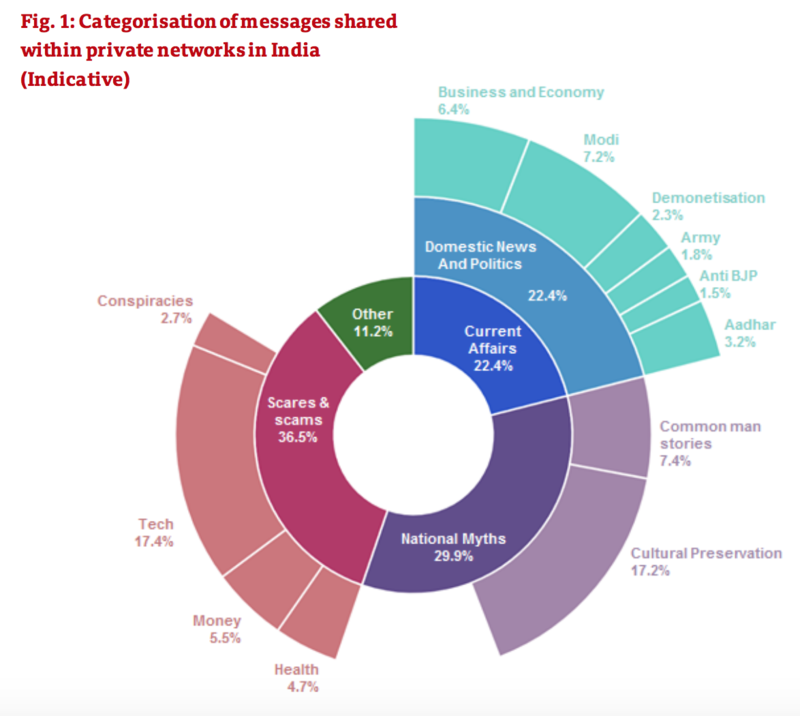 The defining feature of WhatsApp groups in India might then not be its reach or scale or speed of transmission of messages, but the fact that it is enabling homophily, or the drawing together of people in tight networks of like-mindedness. But because of this tightness, then, we suggest that it is possible to use WhatsApp to mobilize. This starts to explain why WhatsApp has seemed quite central to some cases of violence in India. It’s not the speed, or the reach of WhatsApp that has been central to these issues, but the homophily of its groups that has enabled mobilization in the cause of violence. In fact, even knowledge of fake news messages associated with violence is fuzzy at best — and recalled vaguely from media reports rather than from encountering those messages themselves. There is certainly no recognition that it might be getting harder and harder to differentiate between what’s fact and what’s not. And in many ways, there is a level of overestimation of their own abilities to detect fake from fact. As part of the research process, respondents were exposed to a mix of real and fake news messages. And almost no respondent was adequately able to identify the fakes. But one of the more concerning things that we observed happening, though, is that those some looked at legitimate news items or sources and judged them to be fake. As a result, Facebook and WhatsApp’s attempts to curtail the spread of false information may not work in India at all, the researchers write. Illustration by Denis Angelov used under a Creative Commons license. POSTED Nov. 16, 2018, 9:33 a.m.
Owen, Laura Hazard. "Notifications every 2 minutes: This in-depth look at how people really use WhatsApp shows why fighting fake news there is so hard." Nieman Journalism Lab. Nieman Foundation for Journalism at Harvard, 16 Nov. 2018. Web. 19 Apr. 2019. Owen, Laura Hazard. "Notifications every 2 minutes: This in-depth look at how people really use WhatsApp shows why fighting fake news there is so hard." Nieman Journalism Lab. Last modified November 16, 2018. 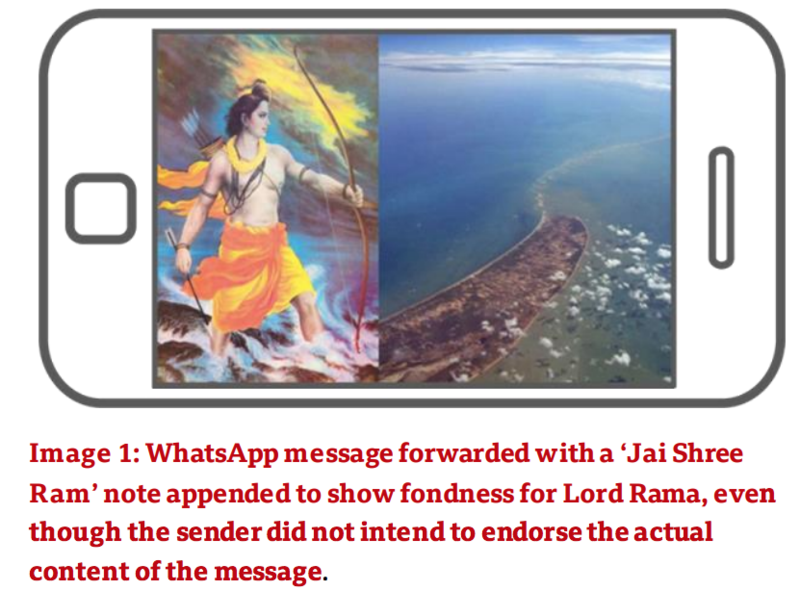 Accessed April 19, 2019. https://www.niemanlab.org/2018/11/notifications-every-2-minutes-this-in-depth-look-at-how-people-really-use-whatsapp-shows-why-fighting-fake-news-there-is-so-hard/.